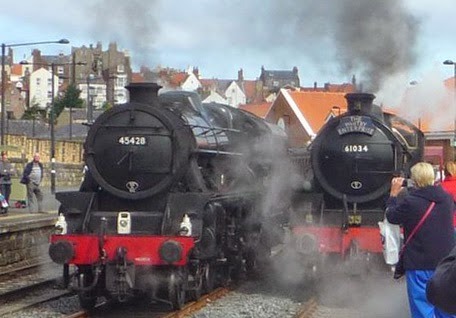 Two steam trains have stood side by side at Whitby station for the first time in 50 years to mark the opening of North Yorkshire Moors Railway's (NYMR) second platform. Locomotives Eric Treacy and Chiru departed earlier from the new platform, which opens to the public on Saturday. NYMR operates steam trains on its line between Pickering, Grosmont and Whitby. The charity said the number of steam trains serving the seaside town would increase from three to five. NYMR hopes it will see an extra 30,000 passengers at Whitby every year, generating an annual £6.5m for the local economy. Managing director Philip Benham, said: "We are delighted that we are now in a position to increase the number of NYMR trains serving Whitby to cater for the growing popularity of visitors to travel to and from the resort by heritage steam trains. "This project and the support we have received, reflects great confidence in the importance of NYMR to the local tourist economy." On Tuesday the 12th August, the heritage railway charity carried out a test run of its new platform with 400 passengers onboard one of its trains ahead of its officially opening. NYMR crews are the only volunteers in the country allowed to use the Network Rail track.